If He Says it’s a Cat – It’s a Cat! Who is this man? 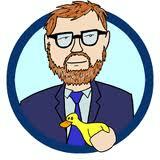 Who is this G.G.Norquist? Grover Glenn.G-man. G. Republican hit man apparently feared by all… (Republicans). Who is this soul who grew up in Massachusetts, father was VP of Polaroid, volunteered for Nixon in 1968, graduated from Harvard with an MBA in ’74? Who is this lobbyist who does not believe in government; who was quoted as saying: “I don’t want to abolish government – I simply want to reduce it to the size where I can drag it to the bathroom and drown it in the tub”.? Who is this man, and why does he hate America? In 1985, he formed a group called Americans for Tax Reform, who’s main purpose is to oppose any tax increase regardless of the situation (even Ronald Reagan raised taxes 11 times). In 1993, he held weekly meetings at his ATR headquarters to fight against the Clinton healthcare plan and as a result became influential in conservative politics. He’s since built a network of conservative believers in 48 states and has regular meetings to coordinate Republican talking points and strategy. All Republican congressmen and a significant amount of Senators have signed on to his ATR’s “Taxpayer Protection Pledge”. Unfortunately, apparently, this pledge protects only 1% of American taxpayers. Who are you Grover Norquist… and why are you trying to destroy the America our Forefathers so brilliantly conceived?